SkyDive, ‘The Big Jump’ 13,000ft. Mike, Kate, Vicky, Clare, Richard, Caroline, Mike Ives, Alex & Anthony. 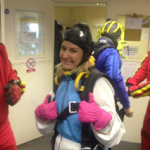 Clare Harrison completed her Skydive on the 27th Oct and raised an amazing £630. Clare getting ready to jump!